If you’re the sporty type and love the great outdoors, there’s nothing better than the light evenings and warm days of the Great British summer to enjoy your favourite hobby. Whether it’s golfing, cycling, walking, playing tennis or sailing, it’s always a lot more fun when the sun is shining. It’s also safer to enjoy these, and many other activities, with a bit of sun protection on. Most of us automatically reach for the sunscreen when we head for the beach, but it’s just as important to protect your skin when playing sport and enjoying leisure time outdoors. If you want to look after your family’s health and well-being, but dread the thought of applying thick, sticky sun cream, we have the solution. 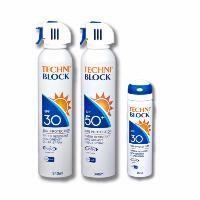 Techniblock® Aerosol Sunscreen is a clear, non-greasy, non-sticky sun protection spray that dries instantly on the skin. Offering a long lasting, water and perspiration resistant barrier against harmful UV rays, Techniblock is oil and fragrance-free, allowing the skin to breathe. The best sunscreen for sensitive skin, it will significantly reduce or even eradicate prickly heat, making it very comfortable to wear. One quick application is all that’s needed to keep even the fairest of skins safe in the sun; it’s easy to use and doesn't need rubbing in so it won’t interfere with your grip or leave a greasy residue on your golf club or tennis racquet. Available in a range of SPFs from SPF15 to SPF50+ as well as an anti-ageing face cream and a lip balm, it’s the easiest way to stay safe in the sun. There’s also a range specifically for young children and the sealed, leak-proof can means no mess in the bottom of your sports bag.